Bahari - lioness of April 2014, thank you! Your comments mean so much to me and a HUGE thanks to my 63 fans,you're awesome! In short, Kovu is worrying whether he will truly find acceptance in the pridelands..
Feb. 27, 2019, 8:02 p.m.
Haven't drawn these two together much... Kion taking a walk with his Simba and sharing some father son time, one of the rare times they're both free of their duties for an afternoon. Experimental background in this piece too, entirely done in SAI, one of my first times attempting a proper background in that programme. Oct. 20, 2018, 7:01 p.m.
Oct. 20, 2018, 6:59 p.m.
Oct. 7, 2018, 9:37 p.m.
Sept. 17, 2018, 9:38 p.m.
Sept. 10, 2018, 9:46 p.m.
Sept. 4, 2018, 9:44 p.m.
An experiment to test out my new tablet! <3 finally replacing my first one after 7 years and worth it! Sooo much more comfortable to draw with and its really helped me to feel inspired. So here's Nala, referenced her colours from a screenshot to get more accurate colours for her. I also referenced the background as I wanted to try my hand at a jungle bg. April 26, 2017, 4:53 p.m.
Sept. 21, 2016, 8:07 a.m.
June 14, 2016, 11:27 a.m.
"Come you guys, hurry up!" I think Kiara would have gone back to the Outlands at least once more when she was a cub. But I don't see Zuri or Tiifu as the particularly adventurous kind, probably why they weren't with her the first time she went. Been working on this for a few days now. Tried a few new things in this pic, thinner and fainter lineart and more blended/softer shading, Also wasn't sure what colours to go with for Kiara, i kinda like the lighter colouring as she resembles Nala more but i felt she needed abit more golden colour. So i went for a creamier shade of gold fur. May 20, 2016, 5:24 p.m.
Jan. 31, 2016, 11:20 a.m.
"Come here Kiara, I want to show you something" Simba said softly, smiling as his daughter nestled between his paws. "Look up at the sky. You see those stars? Those are the great kings of the past, looking down on us. Including your grandfather." "Mufasa? But I don't understand, why is he up there and not with us?" Simba smiled sadly. "Just because he's up there, doesn't mean he isn't with us Kiara. He will always be there to guide you, along with the other great kings. As a wise baboon once told me, he lives in us." Nov. 27, 2015, 3:20 p.m.
Simba and Nala - Entry for the contest :) done with coloured pencils. Nov. 22, 2015, 6:45 p.m.
Just like the title says! Experimenting with different lineart styles.. I think I like the bottom two best, however I wanted to see other peoples opinions? Oct. 9, 2015, 12:54 p.m.
My entry for the contest! I decided to recreate this scene in black and white, using hatch and cross hatch shading. Aug. 29, 2015, 10:03 a.m.
A long time ago, before Kovu and Vitani came along, when Nuka remembered his mother acting lovingly towards him. His father didn't approve of him, but that didn't seem to matter so long as he had his mothers affection. That had all changed after Scar's death, something in Zira snapped. She spoke harshly to him, putting him down. All her attention seemed to focus on Kovu, but not in a loving way. As Nuka was crushed beneath the logs, he saw a look of love on his mothers face he hadn't seen since he was cub. That was the last thing he saw and he smiled; he had finally got her attention again. For the contest. I believe Zira's redeeming quality is that she had once been a good, loving mother. July 23, 2015, 12:56 p.m. 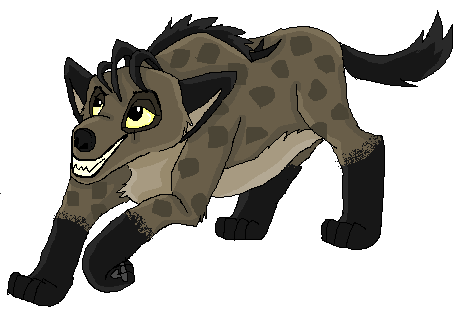 While I can't enter this months contest, I felt like drawing a hyena, I need the practice anyway XD so here's Shenzi! July 7, 2015, 12:14 p.m.
July 4, 2015, 4 p.m.
One night, the two brothers slipped away from the den at the Outlands and into the long grass at the borders. Nuka looked at his younger brother "hey Kovu, climb up on my back I want to show you something." Kovu complied, scrambling up and standing on Nuka's shoulders. "See the stars?" Nuka continued, "Dad always said they were the Great King of the past." "Wow!" Kovu mouthed, looking up in awe. "Do you.. think he's up there?" "Maybe I'll join him someday" Kovu grinned. "You could come too Nuka, then we'd all be together!" July 1, 2015, 12:11 p.m.
A redraw of this http://fanart.lionking.org/Artists/DoodleDayDream/MufasaSarabiSimba.png one of my first canon pictures drawn back in 2010! June 14, 2015, 1:10 p.m.
June 14, 2015, 11:17 a.m.
May 26, 2015, 1:39 p.m.
May 22, 2015, 11:10 a.m.
May 17, 2015, 1:11 p.m.
Aug. 24, 2014, 4:45 p.m.
July 2, 2014, 12:57 p.m.
Well I have an exciting update for you! I am now starting to work on a TLK fan comic! The cover and first page are in the approval queue as we speak! I've been wanting to do one for a while, but needed my inspiration to return first XP it's also why I've put off posting too much canon art, saving the ideas for the comic but I've been planning it for some time now. I think I'm ready for the challenge! In the meantime, here's a look at the design I'll be using for Kopa in the comic, as the first one will be Simba's reign. I don't want to give too much away, but I will say I've tried to steer away from more cliche/overused storylines involving Kopa. April 27, 2014, 5:15 p.m.
".. I don't want to be in my pride anymore, Dad seems to care more about lessons than he does about me.. and moms too busy hunting, she never has time for me anymore..and theres not many other cubs either." "Take my advice kid, you're better off without them. If they really cared, wouldn't they have come looking for you by now? In fact, you shouldn't be in this mess in the first place..." she replied, her tone softer this time. "Come with me instead, if you wish." April 16, 2014, 1:41 p.m.
"Guess it's time to say goodbye to my home... even if it doesn't feel like home anymore.."
The night Nala escapes from the Pridelands, yeah it's been done to death XD but I wanted to it. Tried to alter her colours better for the night scene this time, thoughts? Feb. 21, 2014, 5:40 p.m.
Simba with mother Sarabi, and Shani who is my version of a little sister for Simba. Simba isn't so amused as Sarabi seems to be. Feb. 9, 2014, 5:32 p.m.
"Congragulations, she's beautiful" Digger smiled at the cub in her daughters arms, and Vitani thanked her. There was one question on her mind though, "But who's is she?" Vitani looked up with a smile, "She is Nuka's.. and I'm so glad, because part of him lives on in her. My little Akira." Hi guys long time since I uploaded a proper picture. So yes, in my AU Vitani is the daughter of Digger, and was meant to be bethrothed to Kovu. I like the idea of these two being mother and daughter because they are very alike, but also have distinct differences between them i.e. eye colour, ear rims and freckles. Nov. 15, 2013, 4:58 p.m.
Nala hardly did anything these days, for a long time she grieved the loss of her best friend and king. Little did she know the worst wasn't over yet..
:C just a sad looking Nala, done in sketcher. Nov. 14, 2013, 3:28 p.m. There in front of him, was a familiar lioness. Nala, his mother. At the sound of footsteps she had turned around. "Simba is that you-" she paused, eyes wide and filling with tears "Kopa? Is- is it really you?" While Kopa still did not smile, his expression softened, afterall he had always got along better with his mother. He swallowed before speaking, remembering the last day he has seen her "yeah mom its me, sorry i wasn't back before sunset like i promised." More on Kopa's return, his reunion with his mother. Nov. 3, 2013, 11:18 a.m.
Simba: It can't be.. K-Kopa?! Is it really you? Whats happened to you? Kopa: whats wrong father? Not what you were expecting? But then, I was always a disappointment to you wasn't I? Didn't even bother to look for me did you? They meet again for the first time since Kopa went missing as a cub, but Kopa has changed...why? Wheres he been? I'll tell later! Oct. 23, 2013, 1:21 p.m.
Aisha: last one to the waterhole's a warthog! Amnani: no fair! Wait up! Aisha: catch me if you can! Oct. 13, 2013, 5:22 p.m.
Zira: another male.. do you approve of this one, my king? Zira: Thank you Scar, i know he won't disappoint you, i'll make sure of it! i named him Kovu, after you..
Nuka: but - *voice fades as he realises they aren't listening* .. i thought i was going to be king..
Sept. 14, 2013, 5:33 p.m.
My version of Mheetu as a cub! He loses all of those as he reaches adulthood, except for the ones on his head. June 30, 2013, 1:19 p.m.
Having set the fire, Vitani and Nuka returned to the Outlands. There Vitani saw Zira watching their work, and went to stand beside her. The plan was in motion. Zira: well done Vitani, you will make an excellent queen for my Kovu when the time comes. Vitani: *smirk* that won't be much longer..
My new theory for Vitani is that she is not Zira's daughter but she is bethrothed to Kovu. More on this theory later! May 10, 2013, 10:19 a.m.
May 10, 2013, 10:16 a.m.
May 6, 2013, 2:40 p.m. Felt like drawing Ahdadi and Uru so here it is :> my version of them. May 2, 2013, 5:04 p.m.
Yep bit of canon from me, always struggled with adult Simba so thought i'd give it a go! Fairly pleased with this i suppose. I got some good news and bad news! The bad news is the nib is wobbly and needs replacing but i seem to have misplaced my spare nibs :C feels like my tablet is mocking me..
April 26, 2013, 2:41 p.m.
April 6, 2013, 4:28 p.m.
"I'm gonna rule it all! Hehe"
Cubbie Simba looking over his future Kingdom. Sketcher drawing :3 not sure how much i like it XD oh well practice, practice, practice! March 24, 2013, 6:56 p.m.
"What? Never seen a tiger before?" she called, seeing him staring. "Uh, no actually.." he admitted blushing, not wanting to explain. "I've been following you all morning...i take it you're new here?" she grinned. Jan. 26, 2013, 6:15 p.m.
Shani didnt know what to do anymore. The last time she could remember being truly happy was as a very small cub, but that was before her father and her big brother died. Since then life had never been the same, Scar took his unrightful place as King and corrupted her cubhood friend Mheetu, her mother had had twins born unhealthy. Their health had improved as they had grown up but now they suffered the effects of their father Scar's neglect. Her Mother was a strong lioness but Shani knew that she was tired from grief. And now Nala, the lioness who was like the big sister she had never had, had left to find help. She looked tearfully up to the Great Kings of the past. "Father, i need your guidance, if you can hear me...please help us.."
Jan. 24, 2013, 3:55 p.m.
Nala: i can be, i always wanted a little sister to look after! Shani: r-really?! Thank you, you're the best! Nala and Shani - the cut character of Simba's younger sister. This relates to my earlier contest entry with Mheetu becoming Scar's heir. This takes place after Simba's death and after Mheetu is made Scar's heir - i think that after this happened, Nala would be missing her little brother and want a younger sibling to look after...while Shani who has lost her brother needs an older sibling. I think they would be drawn to each other, and would end up wuth a close bond,becoming like sisters to each other. Jan. 23, 2013, 4:56 p.m.
Jan. 23, 2013, 4:53 p.m.
Mheetu: You're right, im not..
Scar smirked, he knew his loyal heir would be of use to him one day. He took this opportunity to run for it. For the contest! If Mheetu had been in the film, i think that Scar would have made him his heir as long Sarafina agreed to be his mate - and if she didnt agree, Scar would have killed him. Being one of the youngest cubs, Scar could train him more easily and i think Mheetu would have grown loyal to Scar. Jan. 13, 2013, 3:07 p.m.
Jan. 6, 2013, 6:46 p.m.
Jan. 6, 2013, 6:45 p.m.
Sketcher sketch of Zira and Kovu, shes protecting him from something i guess probably Simba.. this was mainly expression practice :3 im pleased with how Zira turned out! July 17, 2012, 12:39 p.m.
June 24, 2012, 3:33 p.m.
April 2, 2012, 3:51 p.m.
March 18, 2012, 11:03 a.m.
"Simba please, have mercy, i beg you..."
"You dont deserve to live..."
March 4, 2012, 4:39 p.m.
March 3, 2012, 5:46 p.m.
"My father said there was a - a darkness, in Scar that he just couldn't escape" - Kiara, Simba's Pride. Taka/Scar begins to show his dark, angry side... lighting and shading experiment. Jan. 15, 2012, 11:22 a.m.
Jan. 13, 2012, 7:27 p.m.
"So where is this really cool place?" Jan. 13, 2012, 7:24 p.m.
Simba staring out over the pridelands at sunset...MSPaint, was practicing scribbly shading and experimenting with a sketchy style and lighting from the sun on Simba. Jan. 13, 2012, 7:22 p.m.
Dec. 18, 2011, 4:47 p.m.
My entry for the Dynamic! contest. A little what if scene where Zira murders Kopa...contains a little badly drawn blood. Sept. 23, 2011, 3:44 p.m.
For the contest! Scar is babysitting Simba while Mufasa attends to his duties as king, and is not very pleased when Simba splashes him whilst playing. Sorry about large file sizem, i tried shrinking it but it ruined the quality so i left it. Sept. 23, 2011, 3:39 p.m.
Aug. 17, 2011, 12:09 p.m.
For the contest! 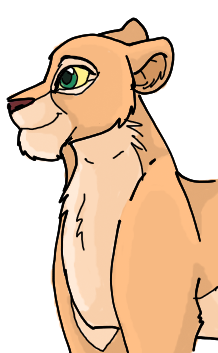 Simba, in the more cartoonish version of my new style! Also! I am taking 3 requests in this new style so comment if you want one! March 14, 2011, 2:06 p.m.
Feb. 16, 2011, 5:06 p.m.
Jan. 29, 2011, 11:01 a.m.
Meet Kali. He is one of Scar's cubs with Sarabi, who was forced to mate with Scar. 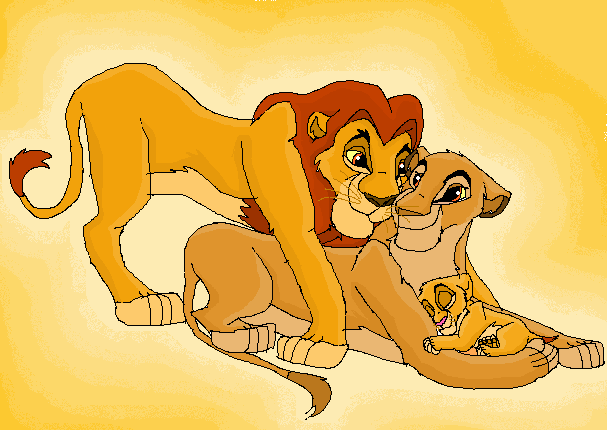 This cub would have been chosen to become king, if it wasnt for Zira who wanted her son to be king. I'll tell you more about this guy later..
Dec. 29, 2010, 2:47 p.m.
Oct. 24, 2010, 9:28 a.m. He couldn't believe he had really done it. He had taken the life of an innocent cub. "SHOW NO MERCY! IF YOU ARE TO BE KING THEN YOU MUST NOT SHOW MERCY! IT IS WEAK!" his mother's voice echoed. He splashed into the small pond. "Please let it wash off, get it off, get it off!" he pleaded desperately. He watched as the blood on his claws slowly floated away, staining the water red. Oct. 21, 2010, 1:23 p.m.
Just thought this song kinda suited Kovu :P quick doodle up. Sept. 25, 2010, 3:58 p.m.
Nuka decides to give Kovu a makeover. 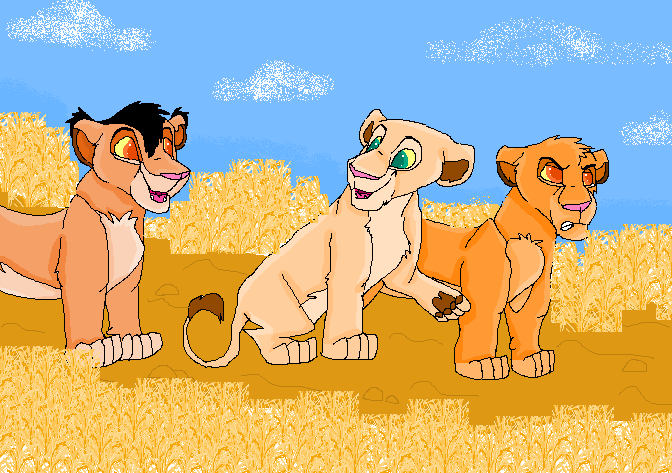 Sept. 18, 2010, 2:35 p.m.
Aug. 27, 2010, 7:37 p.m.
Used an old lineart to create my version of Kovu and Kiara's cubs: the one on the right is a girl named Kura meaning destiny and the other is a boy named Amani, meaning peace. Aug. 20, 2010, 4:09 p.m.
Aug. 7, 2010, 3:04 p.m.
Im a huge fan of N Dubz and i thought that the lyrics of this song suited Simba after the death of his father especially as Simba thought that it was all his fault. Aug. 5, 2010, 4:49 p.m.
Aug. 4, 2010, 1:15 p.m.
Aug. 1, 2010, 10:35 a.m.
Simba awoke just as the darkness of the night sky was beginning to lift. He looked over at his friends still peacefully asleep. He smiled, got up and began to walk away. He kept waking during the night and would find it hard to get back to sleep so instead he would go for a walk and then return before his friends woke up. Today, he chose to take a different walk: through a small group of trees and and onto the rocks. He climbed all the way to the top and as he looked over the lands below him, something in the distance caught his eye. Priderock, and the border of the Pridelands. "Someday, will return" he said to himself, as he continued to gaze wistfully at his old home. July 30, 2010, 6:13 p.m.
July 30, 2010, 6:01 p.m. So for my 70th picture i decided to finally do a picture i've had in mind for a while...Simba with the hairstyles of different charcters! July 29, 2010, 6:43 p.m.
Nala: oh hi Malka! Me and Simba were just going to the watering hole, wanna come? Simba, back when he used to find Malka annoying. Inspired by the comic "Simba's new brother". July 11, 2010, 1:42 p.m.
July 11, 2010, 1:12 p.m.
Kiara: haha, mom! that tickles! July 11, 2010, 12:05 p.m.
June 18, 2010, 6:16 a.m.
Sarafina comforts Nala on the night of Simba's "death". June 11, 2010, 10:57 a.m.
"Hey look, we are one"
June 1, 2010, 12:11 p.m.
May 6, 2010, 1:16 p.m.
April 3, 2010, 1:45 p.m. I think that Nuka and Lottie (my name for outlander Scruffy) make a cute couple, and that sometimes Lottie is picked on for being so scruffy and Nuka stands up for her because he knows what its like being picked on for being scruffy. But anyway, thats just my theory ^^ cute couple? Jan. 25, 2010, 2:29 p.m.
Jan. 2, 2010, 2:59 p.m.
Zira and Kovu in the outlands, Kovu is an adolescent in this picture. The story behind this is that Kovu has just made his first kill on a hunt and Zira tells him that he is doing well and just like Scar but Kovu isnt so sure he wants to be like Scar. Dec. 20, 2009, 6:27 a.m. This is a what if..Simba told Mufasa how he found out about the Elephaunt Graveyard, Mufasa is angry with Scar and telling him he does not want him around Simba. Aug. 2, 2009, 3:19 p.m.
July 21, 2009, 10:46 a.m.